To start a visual representation of old to new for the main summer series races that will make up the 2018 NEMTB calendar. This is PRELIMINARY. Dates and Events could change, we still have promoters we need to contact and verify things with but we feel confident enough in this layout to share it now. So what does this all mean???? Most of you probably know by now that the old Kenda Cup East has become the BUBBA Trophy Series. That series will operate very similar to what you are used to. Some races will be sanctioned with EFTA, some with USAC, some unsanctioned. They will be handling their own awards, series points, etc. 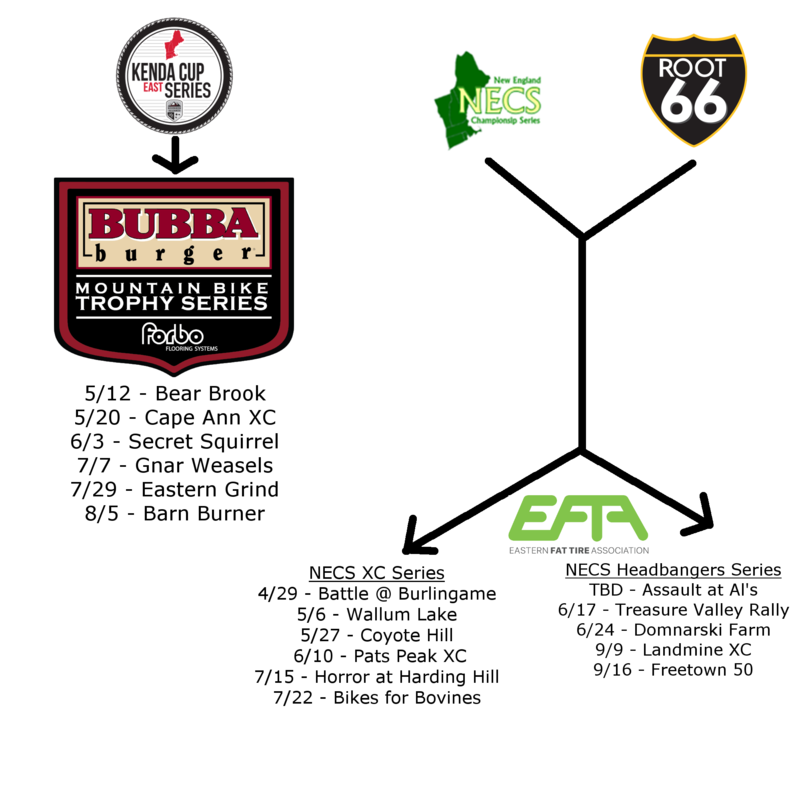 Our partnership with BUBBA Trophy is strong and we will work closely with them to support the EFTA events participating and we are sure this series is going to be something you are all going to want to check out. Root 66 is no more. This left a large number of events out in the cold with no cohesive structure tying them together. EFTA was concerned this could devolve into chaos so we made some changes to how we operate in an attempt to bring the entire community together. Our old NECS series used to be made up of EFTA events exclusively. In an effort to give promoters of old Root 66 events a series to belong to but still let them sanction how they might be used to we are removing that requirement and running our series similar to BUBBA Trophy. These new series will have some EFTA events, some unsanctioned, and possibly some remaining with USAC. We have also decided that instead of having 1 massive 10-15 race series that we would split the new NECS into 2 series. May we present the “NECS XC” and the “NECS Headbangers” Series for 2018! The NECS XC Series will consist of events that trend a bit more “Olympic” in the course makeup and race times. Elite race times should be more towards the new 1.5hr norm. Courses will typically be a bit faster with shorter laps and a bit more flow. The NECS Headbangers Series will consist of events that trend a bit more “Old-School”. These courses will typically be described as very technical and challenging. Lap distances are sometimes longer and race times could exceed 2hrs for Elite. Our hope is that a series made up of similar types of races will increase full series participation. We will also be dropping the lowest score from your overall points so that racers can remain competitive in the series even if you can’t attend every single race. We are also very pleased to announce that we will be working with the folks who bring you the Zanconato Singlespeed CX Series a brand new Zanconato SS MTB series this Summer. This will be a “sub-series” of sorts that will run and exist within these other Summer Series races. The Zank crew will be working with EFTA and promoters to select a set of events that will participate in the series. They will be handling their own prizes and series points and bringing that same fun feel from the CX series to NEMTB. So start converting your bike now and as soon as we have the details ironed out we will let you know. Junior rider support and development was also a recurring theme of the Summit. NEHSCA is a successful program and all stakeholders are looking for ways to support their riders and help them succeed and hopefully continue their racing careers right on through to our Summer Series races. Last season EFTA began our support by issuing Annual licenses to every NEHSCA racer and this year we will continue that policy and take it one step farther. We will be issuing multi-year licenses for all NEHSCA riders that will be valid until they reach 26 years of age. Registration data clearly shows a drastic dip in registered racers in their early 20’s. Our hope is that extending a NEHSCA rider’s Junior membership through their 20’s might remove one of the cost barriers preventing them from getting back into racing after college. There are a lot of moving parts in the NEMTB right now so without doubt there will be additional news and plans to share as we get closer to race season. We just ask for your understanding and patience as we try to put all these pieces together. We can assure you there are a lot of smart, motivated people working hard on your behalf to make 2018 as awesome as possible.